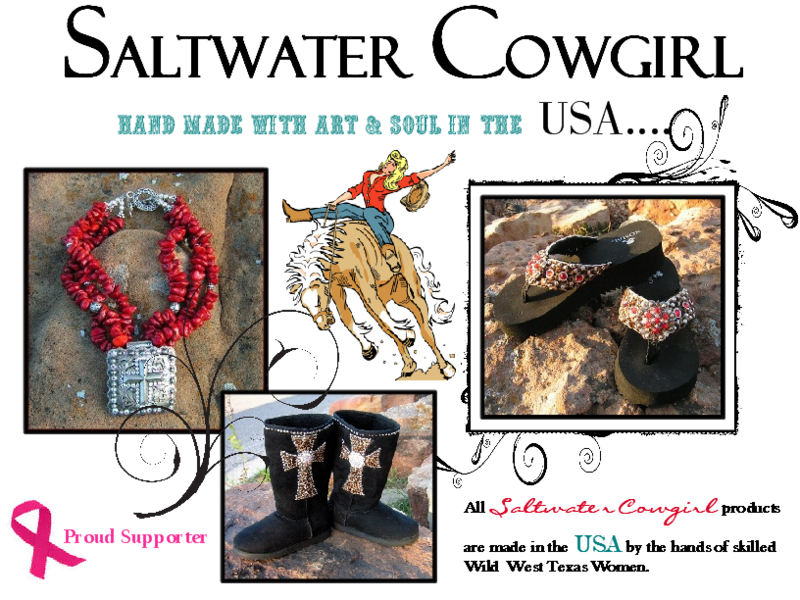 Welcome to Saltwater Cowgirl...Our Jewelry Collection caters to Cowgirls in all walks of life...with a twist of fun and a funky flair our jewelry is as spirited as the "gals" who wear it. From classic Cowgirl to cross over western we strive to keep pace with the ever changing needs of todays Modern Cowgirls. Using only the highest quality materials all Saltwater Cowgirl originals are handmade by wild TEXANS with Art & Soul. Saltwater Cowgirl also offers you a wide variety of handmade Cowgirl flip flops featuring wild hides,leathers and a whole lot more. Come on in and take a look around...you'll be glad ya did! Please note that all of our products are custom made therefore we can not offer as refund once your order has been placed. All Saltwater Cowgirl items come with a 100% guarantee so if for any reason an item should arrive defective and or damaged please contact us right away to expedite replacement. If you are a retailer that would like to carry our line please contact us for wholesale information.